There’s a point, from time to time, where peer recognition and cult status spills over into mass recognition and commercial success, but if that happens, it usually comes before your twelfth album. 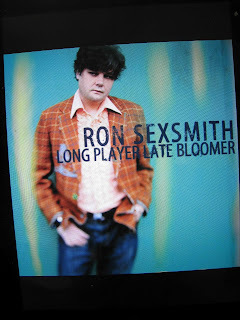 The list of artists who rate Sexsmith as a singer-songwriter aren’t quite legion but include enough heavyweights (Elvis Costello, Ray Davies, Sheryl Crow, Steve Earle, John Hiatt, Elton John, Paul McCartney) to have made some of us sit up and take notice. The problem, however, is that while elegant melancholic folk-tinged pop might sound good you need an avenue to transform peer and critical recognition into mass success and by this stage it’s obvious Sexsmith doesn’t have one. In the current environment, with the old regime in tatters, the download as king (and, from what I can gather, there’s almost invariably a free, illegal source to obtain virtually everything) it’s obvious no one’s going to make a fortune unless they’re out there and gigging steadily, can land a song or three in most of the multitudinous let’s discover the next best thing contests on TV or wangle a duet with the likes of Michael Bublé. Well, he's managed the Bublé bit, and he's gigging reasonably regularly. One avenue that could be explored is recruiting a name producer, and that Bublé duet brought him into contact with fellow Canadian Bob Rock (Michael Bublé, Metallica, Mötley Crüe, The Cult). It mghtn’t be the most obvious artist/producer match, but the result is recognisably Sexsmith in an environment that would probably be radio-friendly if Ron could find a way of sneaking onto the mainstream airwaves. Another collection of quality songs, buffed up just right by a producer who knows his stuff, playing up the melodic strength of the songs and delivering a result that’s engaging and approachable. Try MIchael and His Dad, a song that hearkens back to Sexsmith’s arrival in Toronto with infant son in tow, Heavenly, or Love Shines, an attempt to write a song like Buddy Holly’s True Love Ways. If you’re after perfectly crafted melodic pop delivered with a wistful sincerity and you haven’t encountered Mr Sexsmith to date, he’s definitely worth checking out. There’s not much here that he hasn’t done before, so long term fans won’t be disappointed unless they’re looking for some radical reinvention. Given the fact that he hasn’t managed one to date you wouldn’t be expecting one now, but as long as he can maintain the quality I’ll be buying.